about this book: Courageous men and women were at the heart of Ireland's struggle for freedom leading up to the Easter Rising of 1916 yet women were often neglected in the history books until very recently. Women, who often were from the upper classes worked as nurses and soldiers, spies and caregivers, teachers and diplomats. They fed the poor when nearly all of Dublin's employers had locked out their employees creating city-wide hardship and hunger. They ran fundraisers, traveled abroad to obtain enthusiastic support for an Irish Rebellion. Because of their very influential lectures, extremely wealthy Irish Americans loosened their purse-strings. Irish women smuggled arms and propaganda right under the nose of the British and gave talks on a new Ireland where every Irish man and woman would reap the rewards from a new Irish Republic. One even trained a new Irish army beginning with Irish youth. 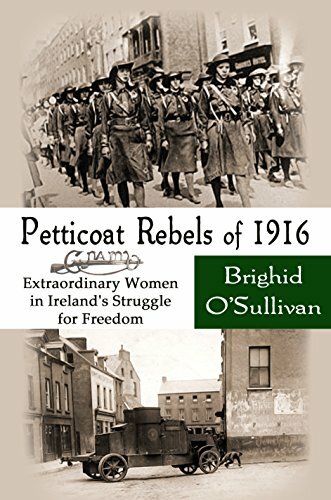 Brighid O'Sullivan has again created Irish history 'without the boring bits' in her new book, Petticoat Rebels of 1916. Meant to be a primer for further study, she explores the lives of several extraordinary Irish women and explains some less known yet worthy female organization crucial to Ireland's future as a Republic. The book is suitable for all ages and has been professionally edited.